Students running for higher office had an opportunity to give voice to their campaigns at ASI’s Candidates Forum in the SMSU Theatre on April 26. 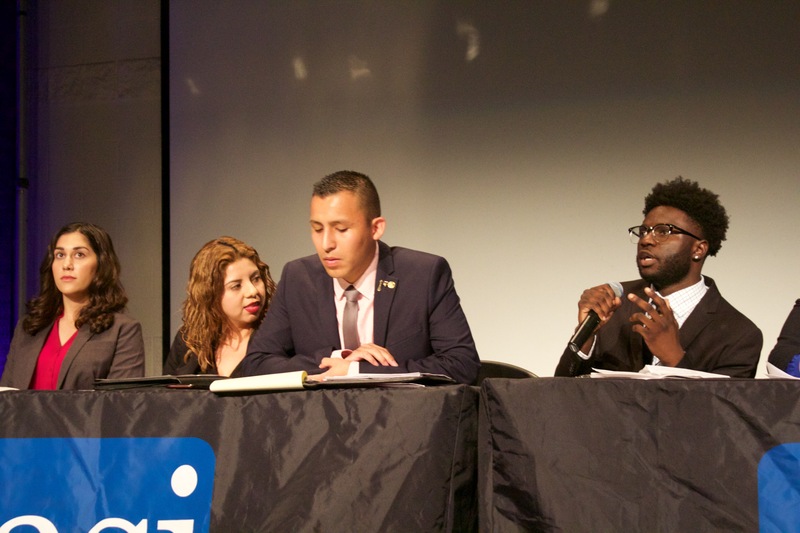 The Forum marked the beginning of the official elections campaign, where candidates would answer questions posed by the moderator. Panelists included: Riane Castro & Andrea Davalos for president, Prince Ogidikpe and Chad Reyes for Vice President and Connor Dickson & Georgette Hello for VP of Finance. Castro who is currently on the executive board for Pi Sigma Alpha, chair of the committee for the SMSU, Vice-Chair in ASI’s Lobby Corps, and works in President Tomás Morales’s office as the Legislative Intern. Expanding job opportunities, grant & scholarship resources, as well as resources renovations such as the DEN, are part of Castro’s platform for president. Davalos is a current member of ASI’s Board of Directors as a representative of the College of Business and Public Administration, and wants to ensure the ideas as ASI President. Davalos wants to ensure the ideas, needs, and concerns of the students are heard and addressed. Ogidikpe who is running for VP, is a 4th year and former SOAR leader who hopes to represent the student voice at large, ensuring the needs, wants, and demands of all students heard. Reyes who is also running for VP, is a current student advocate for ASI, wants to increase transparency between ASI and the students, increase safety, and provide professional development & a memorable college experience. The position for VP of Finance is currently held by Connor Dickson who is running for re-election and challenged by Georgette Helo, a current ASI Student at Large. Positions not on the panel were the representatives running for the Board of Director Positions. Voting for ASI Candidates will be May 3 and 4, at booths located around campus. Pamphlets with more information on the candidates will be available at the voting booths. For more information, you can visit the ASI office in SMSU 108.